Artisanal and small-scale (ASM) gold mining and processing. Emission of mercury damages human health, contaminates water supply, degrades land quality, and causes air pollution. 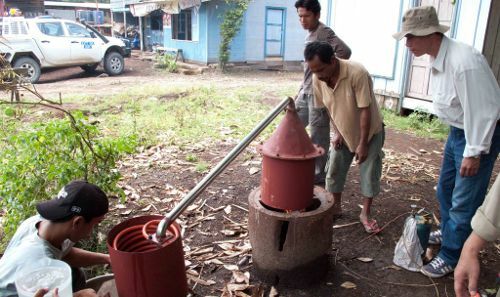 Yayasan Tambuhak Sinta has established a community-based participatory program to reduce mercury emissions includes the introduction of innovative retorts used to reduce mercury vapors and enable recapture of mercury from the gold-mercury amalgam created in the mining process. When YTS began work less than 20 percent of miners were aware of how serious mercury poisoning was and how it was contracted; today over 90 percent recognized the seriousness and impacts of this issue. Their large and efficient retort designs have proven capable of recapturing 80 to 90 percent of evaporated mercury, and are becoming more widespread as the more influential operators adopt their use. Throughout 2009, mercury emissions from this site have been reduced by 2,390 kg. The Mt. Muro site is responsible for approximately 10 percent of global mercury emissions --success here will have significant benefits not just for local mining communities, but also for marine ecosystems and developing world children internationally. It sets an example that can be reused at other ASM sites throughout Indonesia and the entire developing world. Reducing the intensity and frequency of mercury mining could potentially hinder economic development in the region. Mining waste, such as tailings, is not managed and often ejected directly into forested areas or water bodies. UNIDO estimates that mercury amalgamation from this kind of gold mining results in the release of an estimated 1,000 tons of mercury per year, which constitutes about 30 percent of the world’s anthropogenic mercury emissions. It is estimated that between 10 and 15 million artisanal and small-scale gold miners worldwide, including 4.5 million women and 600,000 children . According to UNIDO, as much as 95 percent of all mercury used in artisanal gold mining is released into the environment, creating a danger on all fronts—economic, environmental and human health (2005). Covered by the 2008 World’s Worst Polluted Places Report, ASM still threatens today’s world environment and public health. in silver and mercury amalgamates both gold and silver. Another reason is the miners practice whole ore amalgamation where more mercury is needed in this process rather than amalgamating a concentrate only. As a result, much of the mercury used is lost to the environment as tailings. To worsen the issue, miners in the Upper Barito region use cyanide as an agent to capture an additional 30 percent of gold from the amalgam. Upper Kahayan: Kuala Kurun, Tewah and Tumbang Miri. Gold shops in urban environment have been identified as the major source of emissions in this region because the miners usually carry their gold to these towns, where amalgam is burned at the point-of-sale. There are sixteen gold shops that actively burn amalgam in the three towns of Kuala Kurun, Tewah and Tumbang Miri. Children that are exposed to mercury are particularly at risk for developmental problems. Exposure to mercury can cause kidney problems, arthritis, memory loss, miscarriages, psychotic reactions, respiratory failure, neurological damage and even death . Mercury is a persistent global contaminant, and it has dangerous effect to the human’s vital organs. Mercury can enter the human body through various pathways, including inhalation, ingestion, skin contact, as well as maternal mercury transfer. Once mercury is released into waterways, it becomes a more toxic form of methyl-mercury, which bioaccumulates in the food chain (e.g. high fat-content fish) through bacterial digestion. Having identified major sources of mercury emissions, YTS is currently implementing a community-based, participatory project to reduce the atmospheric mercury releases. The organization has done so by conducting a program of direct intervention, aimed at lowering the level of mercury consumed by gold-processors and subsequent emissions from burning mercury amalgam. Improving local technologies provides an important entry-point into this community and allows the project to collaborate with the gold-processors to solve their problems. Improving the miners’ ability to recover mercury and promoting mercury recycling reduces both mercury emissions and the demand for further mercury. Moreover, improvements in technology not only provide better economic returns due to efficient recovery; but also create safer surroundings for people to work in. In Mt. Muro, the present focus is on designing, manufacturing, transporting, field-testing and distributing efficient and safe large-capacity retorts capable of burning from 10 to 30 kg of amalgam per session. When this retort is used on daily basis, a 20-percent increase in efficiency is expected compared to the current locally made retort used by the miners. One of the major operators who have tested the 30 kg capacity retort reported a recapture rate of 90 percent (estimated 80 – 100 kg per month) and a corresponding reduction in costs to miners. Additionally, YTS continues to distribute small-capacity Fauzi retorts for burning amalgam balls of less than 1 kg. In the Upper Kahayan River, the intervention activities focus on supplying water-box condensers to gold shops that are burning gold-mercury amalgam. The additional reduction of mercury emissions that will be achieved in 2009, as a result of the use of the retort and water-box condenser YTS has distributed so far, is estimated at 2,390 kg of Hg (approximately USD 140,000 of value). The number is expected to increase as a result of further equipment distribution in the last quarter of 2009 and the beginning of 2010. Yayasan Tambuhak Sinta (YTS), United Nations Development Programme (UNDP), United Nations Industrial Development Organisation (UNIDO), Global Environment Facility, and Blacksmith Institute. In certain mining areas such as Galangan, mercury is often supplied to gold shops free of charge, giving individual miners no incentive to reduce the amount used and subsequent pollution levels. Cyanide used to extract additional gold content from amalgam is not regulated—there is no tailing and mining waste management in the region. As mining shifts further inland mercury contamination will spread due to the over-dredging of rivers and heavy deforestation. Artisanal and small-scale mining (ASM) generates a significant portion of economic profits in the Central Kalimantan region. The gross primary ASM economy in Indo Muro is USD 25 million per year.3 If the environmental conditions continue to worsen and sites were no longer available for mining, unemployment and social unrest are likely to occur. Kalimantan’s gold mining community is involved in ongoing developing of retort technology. World’s Worst Polluted Places Report 2008. Blacksmith Institute.